Hope everyone had a very Happy Thanksgiving and now entering into full Christmas mode- shopping, decorating, and party planning!! It’s such a magical season, and our Lord Jesus’s birthday – so light it up!! Ok, so if you are joining in from Let It Snow – DONUT Christmas Party (Part 1: Planning Stage) welcome. If not, check that post out so you don’t miss the decorating planning stage. It will provide tips and decorating inspiration for a fabulous DONUT Christmas party winter wonderland!! Now, for our next step: Let it Snow – DONUT Christmas Party (Part 2: Food Planning). ***UPDATE*** Let it Snow – DONUT Christmas Party (Part 3: The Event) is now ready!! See how all of the planning came together for an adorable party!! I love all of the food ideas that can go with the Let It Snow theme…..and then combined with the Donut Sprinkles theme. For our event, the girls chose the colors blue and white with a pink accent. So when searching for food items, I tried to pick things that would go with their chosen color scheme and also with the DONUT Christmas theme. I looked for: Christmas items, donut items, blue icing/or pink icing items, and items in the shapes of donuts (like cute fruit and sandwiches). So definitely check those out. ***Click on the link below the picture for information on each food item. *** I can’t wait to post pictures of the actual event and see how the yummy treats and snacks turn out!! ***TIP*** For an adult party, you could put a flavored “mommy” drink in a cute glass and use the sprinkles for the rims. Hope you got plenty of inspiration to get your Let it Snow DONUT Christmas Party Planning up and running!! Let me know which ones you pick. Can’t wait to see your ideas!! If you want more donut party ideas follow my Pinterst board Sprinkle Kindness& Christmas Donut Party. Want more Christmas Inspiration? Try Christmas Dining Room, Christmas Stairs, or Christmas Front Door Wreaths. I am still working on the Let it Snow – Donut Christmas Party, and needed something large to cover a couple of areas on the wall in our event venue. I had seen a couple of cute cotton ball wreaths on pinterest, and thought it would be an inexpensive way to cover a lot of wall space. Since I had some extra pool noodles from DIY Christmas Donut Ornaments – Using Pool Noodles, and had already done a snowman craft last year Buffalo Check DIY Snowman: Using Embroidery Hoops ….it was the perfect marriage. Welcome to Christmas Snowman: DIY Cotton Ball Wreath!! ***UPDATE*** You can now see how the Let It Snow – DONUT Christmas Party (Part 3: The Event) turned out!! See how the snowman looks on the wall at the Christmas party – it turned out adorable!! ***NOTE*** You can make this with 3 wreaths or just 2 wreaths (if you want a smaller snowman). The 3-wreath snowman will measure ~ 52″H when finished. CUT: Take first pool noodle, measure out 32″L, and cut with a knife. Use a cutting board underneath so that you don’t scratch your floor or counter top. This will make the SMALL wreath. Take the second pool noodle, measure out 42″L, and cut with a knife. This will make the MEDIUM wreath. You will not need to cut the third pool noodle. This will make the LARGE wreath. TAPE: Now, begin with the third (the long noodle that will make LARGE wreath) and bend it into a circle. Use your packing tape and secure the ends together. Make sure to tape down with about 4 -6 pieces of packing tape. This noodle is the easiest one to bend because of the length. It is the only one that will have ends that fit flush together (not pictured). Next, do the same thing to your small & medium noodles. See picture to right. ***NOTE***The medium and small wreaths will have a little gap so that they can make a circle. The smaller one will also not form a perfect circle….just thought I should mention that. It will be the top part that goes under your santa hat, so it will be hidden. Now, you will prep your area outside with plastic or canvas cloth. Put a couple of wooden blocks to lift noodles off the plastic. Lightly spray TOP side of all 3 noodles with white spray paint or white primer. Let dry 20 mins. Flip them over and spray the BOTTOM side. ***TIP*** Make sure to spray the inside and outside parts of the noodles also. I did a light spray so mine would have a baby blue color peeking through the cotton. If you want it solid white, just spray more paint. I want to be upfront on this part…..this is VERY time consuming. But is sooooo worth it!! Since I learned as I went along, this is my ***BIG TIP*** Pull your cotton balls one day (into a rectangular shape), and hot glue the next day – for each wreath. FYI on time frame: I would pull cotton balls for about 45 minutes – 1 hour one evening, and then hot glue the next day for about 45 minutes- 1 hour. Hot glue one layer at a time. I did one top layer, one inside layer, and then one outside layer to keep straight lines. I also offset each layer so that it wouldn’t look like one straight line. In other words, start 2nd layer with cotton ball in between 2 cotton balls. See picture below left. I hot glued cotton balls on the entire backside also, but you can leave unfinished if you want. It would look like picture below right. Large wreath: 315 cotton balls, 25 glue sticks, 1 hour 45 mins -2 hours completion time. Medium wreath: 225 cotton balls, 20 glue sticks, 1 hour 45 minutes completion time. Small wreath: 165 cotton balls, 15 glue sticks, 1 hour 30 minutes completion time. Take your 3/8″ wide white grois grain ribbon and thread through eye of needle. I used a 6″ upholstery needle, and ~ 18-20″L ribbon for each one (5 strips total). Then poke your needle through the inside moving to outside of wreath, and pull the ribbon through. Leave one part of the ribbon on outside of wreath and one part of ribbon on inside of wreath. Then take ends of ribbon and tie a knot. Once that is done, you will make a second knot about an inch up. This second knot will be your loop to hang your snowman. ***NOTE***I showed it using an extra piece of pool noodle first – so you could see what it will look like better. See picture below. Then, I will show what it looks like with the cotton ball wreath. You will now do the same STEPS 1-3: THREAD, PULL THROUGH, AND TIE to the bottom of the small wreath, top and bottom of the medium wreath, and top of the large wreath. BUT…..instead of tying the loop, you will tie the bottom of the SMALL wreath to the top of the MEDIUM wreath. And tie the bottom of the MEDIUM wreath to the top of the LARGE wreath. ***NOTE*** You will not need to thread the bottom of the LARGE wreath because it doesn’t attach to the wall or another wreath. My picture below left shows them with loops – sorry!! This was how I knew that I didn’t need to make the LOOPS for this part. I forgot to take another picture with them untied. The picture below right is the small and medium wreaths tied together. Now you can hang it on an existing wall hook or use a command hook if you don’t want a permanent wall mark. ***Also, if you want a smaller snowman, use the SMALL AND MEDIUM wreaths only for a snowman that measures 30″ H. Or use the MEDIUM AND LARGE wreaths only that measures 39″H. *** I cropped my picture to give you an idea. Go to Buffalo Check DIY Christmas Ornament Balls for the large pom pom balls with bows tutorials. Last month I started a new series of posts on my top pinned images/ top pinned rooms…. and this is post #2 – woohoo!! I am recreating my top pinned image/room each month by giving tips and helping you get the look!! Click here to see Recreate this room: cozy cottage (for September). So, this little modern farmhouse beauty has won for the month of October!! And it’s no secret why. The simple clean lines of the rustic wood planks blend effortlessly with the smooth round lines of the dark stained embroidery hoop. 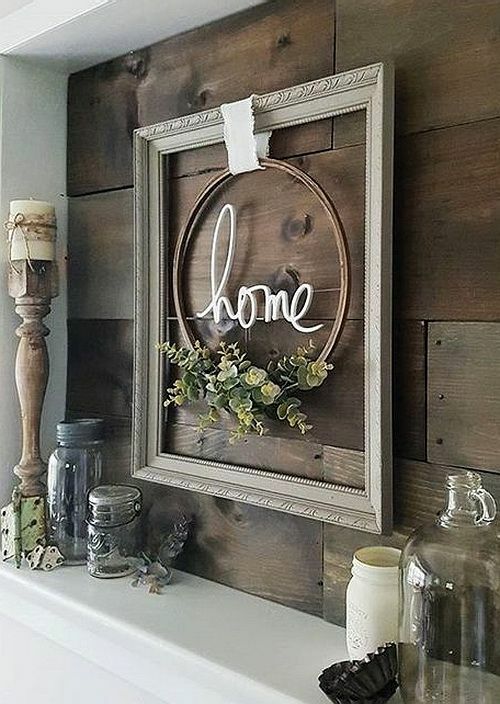 Pop in some fresh greenery to the hoop and a welcome “home” sign to the inside of the antique frame…..and you have an instant modern farmhouse winner. So, how do you recreate this look: modern farmhouse framed embroidery hoop? Let’s find out!! Looking for more modern farmhouse decorating ideas or shiplap plank ideas try The Shiplap Guide: shiplap, tonque and groove, and plank walls (part 1) or 41 Shiplap Ideas (not just for walls). Or try Modern Farmhouse Staple: The Antique Black Bed (part 1) or Modern Farmhouse Staple: The Antique Black Bed (part 2), 12 Best Modern Farmhouse Bar Stools, or Find Your Style: FourModern Farmhouse Mood Boards. ***NOTE*** This is not my photo, but my top pinned image for the month. Just wanted to make that clear. thnx !! So, what or where do we think this vignette is? To me, this area looks like a niche (cut-out) in the wall -with a border trim and shelf at the bottom area for the antique knick-knacks. What do you think? But….. it could also be super cute over a fireplace mantel as an accent wall/area. Just thinking out loud here. Wink-wink!! Let’s start with figuring out the size since scale is key!! We are going to guess that this is a 3’x 3′ area = 9 square ft (or possibly 3′ x 4″ = 12 sq ft). Since I have some antique mason jars, I measured them to give me and idea of size. The smaller jar is 5 1/2 inches and larger one is 7 1/2 inches. So I am guessing that there are probably three 10″ or 12″ wood planks and one 6″ or 8″ wood plank (based off sizes of the jars up against wooden planks). Then I measure about 10″ on either size of the frame for the accessories, plus add the frame to that. ***Just wanted you to see how I calculated my dimensions. *** If you have a larger area, just increase the quantities listed below or go with bigger sizes to make it proportional. ***NOTE*** I have chosen items that will mimic “the look” of this pin, but will not be exact replicates. I have also added some items that support the modern farmhouse design that you might like. Let’s look at some close up pictures to see what is needed to mimic the look. For me, it’s easier to put the accessories into groups. If you have any questions, let me know!! Send me some pictures if you decide to try this stunning vignette – I’d love to see how your project turns out!! You got this!! Looking for more farmhouse or shiplap plank ideas try The Shiplap Guide: shiplap, tonque and groove, and plank walls (part 1) or 41 Shiplap Ideas (not just for walls). I am co-hosting a Christmas Party for an organization in December, and donuts is the theme – click here for Let it Snow – Donut Christmas Party for more info. Since we are working with a very small party budget, and definitely a very small decorating budget, buying a ton of donut ornaments wasn’t really an option. Plus, we needed a craft that the girls could participate in for the party. I had been looking for a couple of months trying to find a good tutorial on making “fake” donuts. All of the tutorials with clay looked too complicated or time consuming, and the ones with making fake icing looked like too much work – LOL!! So, that is how I ended up with DIY Christmas Donut Ormanents – Using Pool Noodles. ***UPDATE*** See how the donuts ornaments completed the look for the Let It Snow – DONUT Christmas Party (Part 3: The Event). They worked our even better than planned – they were used throughout the party decor, and made the party come to life!! Want more Christmas craft ideas? Click Buffalo Check DIY Snow-Woman (part 1) or Buffalo Check DIY Christmas Ornament Balls (part 2). We are decorating for an event so we need quite a lot of ornaments. Using the supplies listed below will make 180 donut ornaments (with 2 pool noodles). If you want less, adjust supplies according to your needs. Here is a breakdown to give you an idea. For garland, you will have one donut with sprinkles & one solid. This helps make them “pop” off of the white tinsel background. Love the bow: click How to Make the Perfect Bow. The numbers are their graduating year (2022), and will go on a sign in the event center. The girls will be decorating these for their craft project. Just wanted to show you where we are planning on using them. Cut each pool noodles at about 5/8″ sections (5/8′ is between 1/2″ and 3/4″ – fyi). Each noodle should make roughly 90 small donut rings. So you will have 90 blue donut rings + 90 pink donut rings at this point = 180. Follow directions on Whipple box. After getting it ready, gently squeeze icing onto donut ring. Use sparingly so that you can make 24 donuts. After squeezing a small amount on top and sides, use q-tip to spread out. Do all of the icing on donuts fairly quickly so that the Whipple doesn’t begin to dry. You will need it damp so that the sequins can stick into it and mold. Place chosen sequins on with tweezers and push down into icing with q-tips. Put sequins out in colors and sizes to make this process go faster. ***TIP*** Work quickly with this section so that icing doesn’t dry. Also, gently place sequins onto icing so that your tweezers don’t get icing on them. It will get very messy if your tweezers get dirty. One jumbo cotton ball will cover 2 donuts rings. Gently pull the cotton ball from both sides until it makes a very long cotton strand (will almost look like a mustache – ha!). Then tear it in half. One section will fit one donut. Then hot glue cotton strand onto tops & sides of donut. ***TIP*** You might have to play around with the cotton to see how much your want on the sides. It should mimic icing dripping down. ***TIP*** I got about 6 cotton balls (12 pieces) ready at a time so that I could do a lot of hot gluing in groups. This step also takes about an hour. This will be similar to the fake icing tutorial except you will be using hot glue to secure sequins to cotton balls. Choose the sequins you want to use and grab with tweezers. You will add a SMALL drop of hot glue to SEQUIN (not cotton) and gently place onto cotton top. Use your q-tip to hold sequin down. ***TIP*** Do not get into a rush with this step or you will have a hot glue + cotton ball mess!! To make this step easier, I picked all of the larger sequins I wanted to use, and then put them on first. They took up more room on the donut, and then I could tell what other colors and sizes to fill in the gaps with. This step takes another hour – fyi. Add a small ornament hook into top and back side of donut. The foam makes it very easy to poke your hook through. I tried a paper clip, short hook, and long hook to see which one I preferred….and ended up liking the short hook the best. The paper clip of course is the cheapest version if working with a low budget and is the strongest (fyi). AND YOU ARE DONE!! CHEERS LADIES!! Add them to garland, trees, wreaths, and more!! What will YOU use them for?? Let me know. I can’t wait to see !! Want to see the What we will be using them for?? Here is the link again Let It Snow – Donut Christmas Party. Next post Let it Snow – Donut Christmas Party: Food (donut inspired food & snacks)….coming soon!! Want more decorating inspiration?? click 41 Shiplap Ideas: Not Just for Walls, 29 Fabulous Wallpaper Ideas, or Master Bathroom Remodel: Hardwar Bling. I am planning a Christmas Party with another mom for an organization that my girls belong to, and we needed a cute idea for the theme. Most of the traditional Christmas themes have been done like a zillion times, and we thought it would be fun to try something a little different. Initially, I liked the idea – ” let it snow”, but unfortunately the place where we are having it doesn’t allow glitter. Bummer- there goes that idea. So, I kept searching through pinterest and began to notice a lot of “donut sprinkles” ideas show up. Another adorable theme, but no shimmery Christmas donut ideas popped up. Bummer X2!!! And let me tell you….. there is NOTHING on this idea….. with these 2 themes joined together. Light bulb moment: I thought of our adorable donut bar (see food section below) we borrowed for our school’s 8th grade dance last year…..but still no combo ideas to get inspiration from!! So, what’s a blogger supposed to do?? Well, make a combo idea come to life: enter “Let it Snow” + “Donut Sprinkles” = Let it Snow – DONUT Christmas Party with the “o” in snow as a donut!! And the LOVE STORY begins – hahaha!!! There is so much information (= adorable goodies) to cover …. that I decided to split this event into 3 posts. The first 2 parts of the series will have several tutorials attached (I will get to these asap)!! Here is the PREVIEW of some of the items we will be using!! ***NOTE*** Part 2 AND Part 3 ARE BOTH done – woohoo!! Click Let It Snow – DONUT Christmas Party (Part 2: Food Planning) for donut and Christmas themed food!! Click Let It Snow – DONUT Christmas Party (Part 3: The Event) to see how it all came together!! These blue and white “lollipops” immediately came to mind. I used these as flowers for my “flower pot cupcake party” several times now, and knew I would just have to convert them into lollipops. These will be used as table centerpieces for the event. Click here How to Make the Perfect Bow. *** STAY TUNED*** I’ll do a tutorial on these lollipops soon, and I’ll add the flower pot cupcake party too. I knew we would need to have a TON of white: snowflakes, fake snow items, shimmery tinsel & garland, and pom poms (cotton balls) because they’re just too fun!! Donut Ornaments: from pool noodles. *** TUTORIAL is ready!! *** Click DIY Donut Christmas Ornaments using Pool Noodles. Will you try Let it Snow – DONUT Christmas Party (Part 1: Planning Stage) tips & tutorials? Which one of the invitations is your favorite, and would you use it??? What is your favorite part of the planning stage so far? The colors? The donut floats? The donut ornaments? The fake “snow”? Let me know what you’re thinking – I’d love to hear from you!! Want more Christmas DIY Ideas: Try Buffalo Check DIY Snow-Woman, Buffalo Check DIY Ornament Balls, or Christmas Snowman: DIY Cotton Ball Wreath. *** After you put down your dropcloth or plastic covering down to protect your floors (or garage- even though I did not- ha! ), you are ready to begin. I always use leftover wood pieces to lift my furniture, but you could use extra paint cans, etc…. Dry-brush your table using your angled paintbrush, making sure not to cover it completely. To dry-brush: dip your brush into your paint, and then gently dip your brush onto a rag to get the excess paint off. You will not want a lot of paint on your brush for this method. Let dry overnight. Then apply 2 more coats covering a little more of the areas where you can see the natural wood peeking through. Let dry over night between each coat. You will still have some natural wood peeking through after 3rd coat. Sand edges, legs, & drawer corners with 150-grit sandpaper. Just press firmly to sand in some spots, and then apply lighter pressure in other spots for a more natural distressed look. *** NOTE *** I forgot to take pictures after I sanded, so these are after the liming stage. I just wanted to let you see the sanded areas. You will work in small sections for this step. Add liming wax with your wax brush in straight lines (not x-motion) brush strokes, then buff with a rag after 15 minutes (not an hour). I buffed mine with a rag after about 15 mins (not an hour like the can says). The longer the liming wax stayed on, the harder it was to buff off. This was my personal preference for the look I wanted – fyi. You will not need a lot of liming wax on your brush, but you will have to continue to add it after. EVERY. brush mark!! This is the most time consuming step, but adds the MOST critical part of the project. ***NOTE*** I followed instructions on wax can and did x-MOTION marks (the first time – picture 2 below), but I personally did not like it. So after it dried, I buffed it with heavy pressure to get x-shaped marks off. I wanted a cleaner (straight line – picture 3 below) type of look. Let dry overnight. It is still a little tacky after the liming wax is applied, and needs to be completely dry before the next step. Using a designated brush, apply dark wax to entire console table. I also worked in sections for this step, but in bigger sections than liming wax. Let dark wax sit for 15 mins, and wipe off with t-shirt (not rag). The t-shirt allows you to glide over the wax without wiping it off completely (like the rag). Allow some of the dark wax to remain in crevices and grooves for a more authentic antiqued look. Let dry Completely Overnight. Then wipe off/buff again – but this time use rag. The rag will help get ALL excess dark wax off. Apply clear wax to entire console table, let dry, and buff to shine. If you want a shinier finish/look, add 2 – 3 layers of clear wax. For a matte/flat finish, just apply one layer of clear wax. Since I am such a visual person, I thought you would benefit from these pictures. Here it is from beginning to end – showing the different stages. Now you can definitely see how the liming wax softens the blue color, and adds dimension/texture to the table. Then the dark wax changes the color again, and blends everything together. I love how the pictures tell the story – right?? Let me know how your console table makeover turns out!! I’d love to see it – you got this!! Want more painting tips or inspiration? Try Distressed Hand Painted White Round Mirror – DIY, How to Stain Bansiters Dark with Java Gel, or Master Bed Frame Makeover – Painted White. ***Want the LOOK, but just don’t want to do the work? Now that we have settled into our home (a little more) after flooding, I can honestly say that it’s slowly beginning to feel like normal!!! Hallejuhah!!! Cue to the angels & the choir, because HOPE is in the air!! It might also be due to the fact that I am taking a fabulous bible study class called “Anchored in Hope,” (taught by an incredibly blessed woman), but regardless, something beautiful inside the soul is taking place!! And that hope has inspired me to finally get around to do a post on our Master Bathroom Remodel: Hardware Accessories. ***Update*** Click HomeTour: Coastal Farmhouse Master Bedroom or Home Tour: Summer Dining Room to see more of our house makeover. Sink, shower, tub, and Barn door Hardware will come in next post – so stay tuned!! I knew there was a ton to cover in this room, and that is probably why I have been procrastinating on getting this post done – LOL!! Now, that I am looking through pictures, etc…., I know that I will have to split the master bath remodel into several posts. So, just sit tight…. it’s coming!! I will honestly admit that I had NO idea how much thought and planning went into a master bathroom remodel. It’s very overwhelming (probably because I hadn’t planned on flooding – arrrrrgh!!) at first, but with the right planning it is achievable. For this post, I will do some before, during, and after pictures on our master bath remodel…..and share my picks for master bathroom remodel: hardware accessories!! ***NOTE*** This post contains affiliate links which means that I will receive a small compensation if you purchase from those links at no cost to you. This helps support my blog, and allows me to write freely. Thanks so much for your support!! This is during the sheetrock phase…..
Want more information on barn doors, click 55 Incredible Barn Door Ideas: Not Just For Farmhouse Style. If you have any questions, let me know! Did you like the changes we made….and if so, which one was your favorite? Shoot me a comment – I’d love to know what y’all think!! Want to see more before & after pictures of our remodel click: Hurricane Harvey Flooded: House Makeover. Want more painting advice…try Master Bed Makeover or Painting Kitchen Cabinets White. Love modern farmhouse: try 12 Best Modern Farmhouse Bar Stools, Modern Farmhouse Staple: the Antique Black Bed, or 41 Shiplap Ideas: Not Just for Walls. We all know there are just some pins that everyone LOVES, and get pinned over and over again!! Every time you scroll through pinterest, it keeps popping up, and you STILL click on it every time. No matter what you do, you can’t control yourself!! You know the ones that I am talking about!! They are Magical & Dreamy- just like the picture below! There is just something special about this room that makes you want to curl up on the couch and get cozy – am I right?? So, what’s a girl supposed to do?? Well, if you’re a blogger like me……you create a new blog series – called Recreate This Room where I show you how to get this look. Let’s go!! Who’s ready to create this room: cozy cottage??!! What makes this room sooooo special? Well, from the sheepskin rug on the sectional to the white-washed brick fireplace with cascading greenery….it just screams “welcome.” It is soft, yet sophisticated. It is understated, yet balanced. It is white and fresh, but still warm. It is gorgeous!! The room is not “staged.” What does that mean?? The bean bag is somewhat crumpled, the sheepskin rug is gently hanging off the chaise sofa, and none of the decorating is symmetrical. You “love” the room…..well because it looks “lived in.” And if you love it that much (because we know it is a top pinned image), how can you duplicate this look? If you are looking for more brick fireplace inspiration or more information on German Schmear technique…..click here or here. If you are looking for more brick fireplace inspiration click: 35 Gorgeous Natural Brick Fireplaces Ideas, or 30 Stunning White Brick Fireplace Ideas. Happy Shopping!! Have a great weekend!! p.s. What is your favorite item from the list? or do you have more than one?? I am torn…I think the woven tray and lantern are my picks!! Let me know if you have any questions or need help finding anything?